Today was our last day of our Habitat for Humanity build and what a day it turned out to be!!! To start with, we moved bricks at the second house for most of the morning....I don't think you ever get used to the heat in India, especially the humidity. With about 7 people, we moved approximately 1500+ bricks from the road to the build site. By noon we were all drenched in sweat and ready for a break. Today was a half day of work for us. 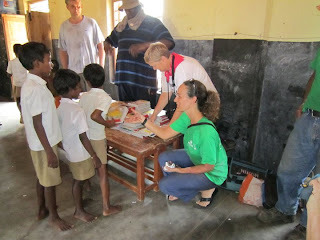 We had the opportunity to visit the village school and meet some of the children...maybe about 40 of the students. In fact we purchased notebooks for all the students in the lower primary grades...something we were told they needed. When we arrived at the school around 12:45pm, the students were expecting us and eating their lunch. It was interesting to notice that the boys ate in one end of the room and the girls in the other. They were all very excited to see us and many recognized us from the build sites over the past couple weeks. After they finished their lunch and cleaned up, they sang us a couple songs...very cute. Then each of them came up and we all had a chance to hand out three notebooks to each of them....none of them could afford to buy notebooks for school, so this was a very necessary gift for me. They were so polite...they each shook our hand and thanked us in English for the books. Once we were finished handing out the books, we went outside in the play area for a bit to chat with the students and take some pictures. The kids love to shake your hands...you feel a bit like a celebrity, which is kind of strange really. Jim actually had many of the students sign his Habitat t-shirt...I'm sure they loved that. After we visited the school we headed back to our tent for lunch. We were leaving the village around 1:45pm, as we had to go back into Pondicherry to shower and get ready for the ceremony happening at 4pm. By the time we arrived back at the hotel, we had about an hour to get ready. Now an hour may seem like a lot of time to get ready, but when you are trying to put on a sari for the first time, an hour is not all that much time. Four of us decided to wear saris...I gave Kaitlyn one of mine to wear...and she looked beautiful...so we had lots of work to do. Remember we have 6 meters of material to do something with and no idea what we were doing!!! After about 15 minutes we decided we needed some additional help and asked one of the hotel staff to help us get dressed. It was amazing to watch her fold, pin and tuck all the fabric to create these beautiful dresses. The vibrant colours and beautiful silk material made you feel like a princess. Within 30 minutes she had all four of us ready to go and we even had time to take some photos....felt a bit like prom all over again!!! We headed down to the lobby expecting the guys to be dressed in their traditional sarongs....and they all bailed on us!!!! Don't think that didn't go by without a few words by the rest of us. Either way, we all looked great, took some amazing photos and boarded our bus for the village by 3:45pm. I must say, wearing 6 meters of material in 35+ degree heat is certainly not something I would like to do on a daily basis....it was hot!!!! 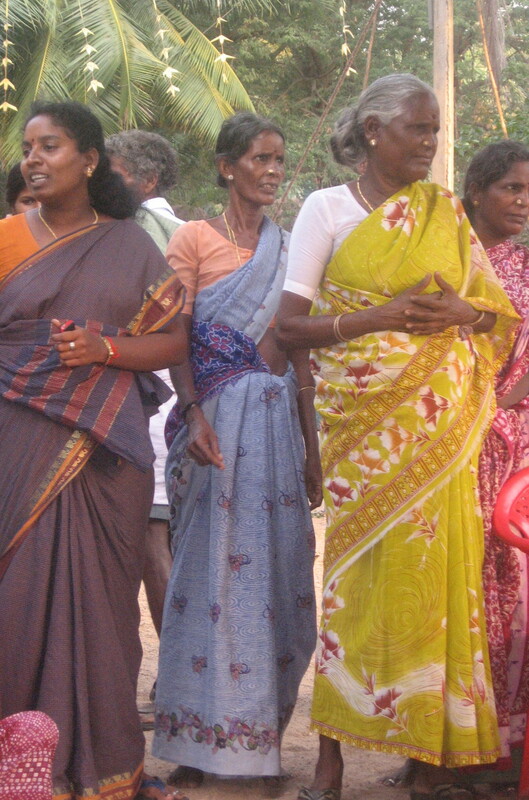 I kept thinking about all the women we saw working in the fields, doing laundry and even helping at the build site in their saris....I have have no idea how they did it. We arrived at the village around 4:30pm to a warm welcome. Many of the villagers were waiting for us, along with the children...of course. Just after we arrived, myself and Caitlin were wisked away into the shed where about 10-15 of the girls were waiting to help redress us. I had no idea why we were there, but within a couple second, I had about 4 girls tucking and tugging on my sari and telling me how beautiful I looked...one girl told me I looked "handsome" and "super". What we found out later was that we had too much of our cleavage area showing...even though we had a blouse on under our sari...and needed to be fixed up. Quite funny really. So after we had our saris repositioned we then visited each of the five houses we worked on over the past two weeks, presented the homeowners with fruit and food and then had pictures taken as a group with each of them. One of the homeowners was an 80+ year old man who said that the one thing he was most excited about in his life was to finally have his own home....how amazing is that!!! Each of the homeowners shook our hands...and I mean shook them...as they were very grateful for our support and help in making their dreams come true. In fact most of the homeowners were in town earlier today, as their loans arrived for their homes, so they had to go to the bank and then order supplies. What a great feeling it must have been for them to know soon they would have a decent home to live in. After visiting each of the homes, we then headed back to the tent area where there were the customary speeches and we were each presented with leis. Finally some of the children put on a cultural dance show for us....it was so beautiful. Six girls came out dressed in their saris and danced for about 15 minutes...what a workout. Then two other children did a final dance for us before we had about 5 minutes to say our final goodbyes. A pretty emotional afternoon knowing you would probably never see these people again, but also knowing you have made such an impact on their lives...no doubt forever. Lots of tears were seen, many smiling faces, hand shakes and endless waves as we drove off in our bus. What an incredible way to finish such an amazing day and experience....it really can not be summed up in words. We arrived back at the hotel around 7pm...hot and tired...took some additional photos in our room....Lisa and I had a hard time deciding if we really wanted to take our saris off...lord knows we will never get them back on correctly anytime soon!! Around 8pm we headed down to the hotel bar for a drink with the group and ended our evening with our final dinner at the hotel in Pondicherry. What an amazing group of people I have had the pleasure to spend the past two weeks with. It's not always that easy to bring together 12 people who know nothing about each other and gel so nicely together.... couldn't have asked for a better team and am so glad I made the decision to be part of this Habitat for Humanity India Global Village build....I've made friends forever, both near and far. I highly recommend taking part in any of the Habita for Humanity GV builds and will certainly be participating in another one in the near future....maybe Thailand or Vietnam in 2013!!! Tomorrow we are off to the final portion of our Habitat experience...the R&R portion of our trip. Time for a bit of rest and relaxation before heading back home. So I guess we'll see what tomorrow bring. Day 3: All New Jobs!!!! Day 7: More Building...Plus Some Fun!! !